was the guest there to measure things??? This unsaid competition over flavorings by potato chip makers has reached the level of ridiculous. It used to be that you had regular and *horrors* barbecue. Now, we have 87 different kinds of BBQ and all kinds of other tuff they put in, on, and through the P.C. If I want a hot dog, I'll have a hot dog. Are there people out there who crumble up potato chips and put them on hot dogs and then pour on the mustard? Yellow or brown mustard? 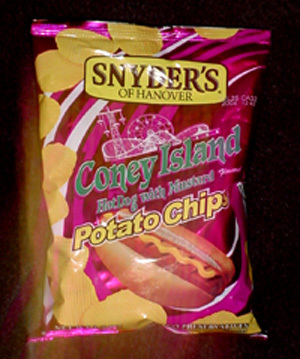 Can you still buy the coney island hot dog chips???? I liked the Coney Island hot dog with mustard chips, But they discontinued them. Any ideas where I might get some? I remember the Coney Island chips fondly. I was working in a grocery store and a vender from Snyder's gave us a bag to try out. Everyone went bonkers for it. Snyder's then came up with other flavors that were equally as good - Steak & Onion and Sausage Pizza being my favorites. Now I can't find any of them and I'm very disappointed. They should try to market them through gourmet shops and the internet. Too bad such unique products are gone. My husband loves the hot dog chips where can I get them?